Purchase the presentation from our store with any credit card. Donations fund the production of conservation films and new presentations. Low income school districts may opt for the low range donation of $100-$200, but for larger organizations typical donations range between $500 and $3,000. 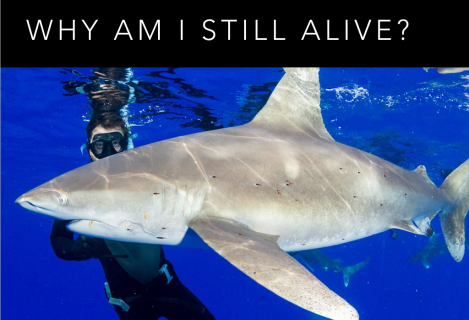 WSV founder Skyler Thomas has won over 20 awards for his films, has swam with 20 species of shark, and interviewed more than 20 shark researchers. His presentation, Purpose, is currently nominated for TedX. He is available to give multimedia presentations at a wide variety of venues ranging from museums to elementary classrooms. In addition, the self-contained exhibit "Killer Personalities" can be booked for display at locations across the United States. 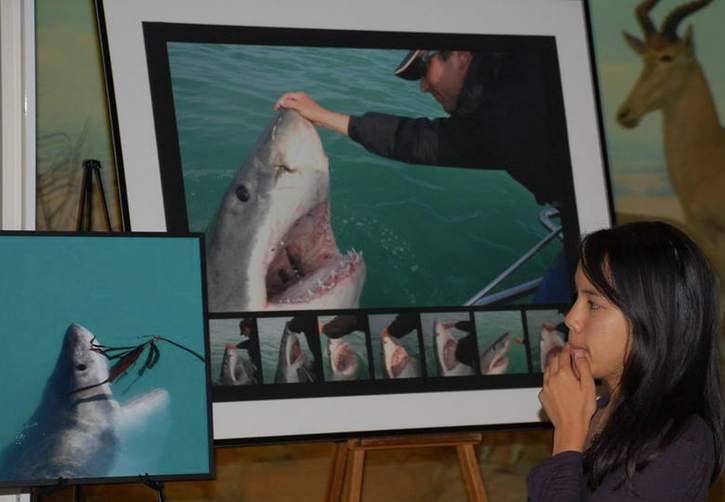 This gallery consists of high def photo prints of sharks who have been identified as having very special personalities. A video presentation consisting of interviews with each of the divers who encountered these sharks as well as stunning underwater footage followed by a Q&A session completes each gallery evening. Purpose: Why am I still alive? Because sharks serve many purposes, none of which include eating humans. Stunning footage and humor show the audience a glimpse into the complicated and beautiful niche sharks fulfill. White Shark 101: Basic anatomy and behavior of the white shark. This presentation explains what makes the white shark so unique and debunks myths such as "the black, lifeless eye". Swimming with Sharks: Stunning footage of interaction with multiple species of sharks with a discussion of what it's like as a diver and what to expect from the sharks. Balance: This presentation is based on White Shark Video's latest release, currently in the film festival circuit, 'Balance'. Why are sharks important to the planet? What are examples of specific roles these animals play? 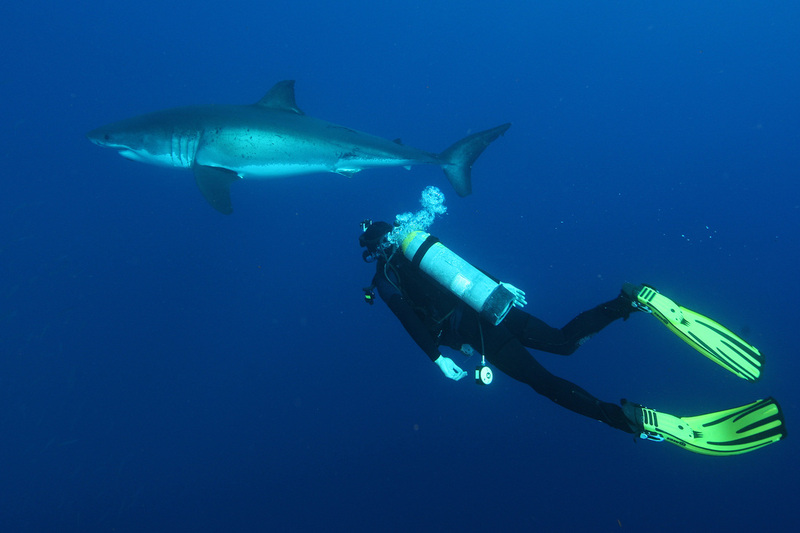 What are the pros and cons of ecotourism for both people and sharks? Great White Lies. This presentation dives into the corruption that exists in the world of politics and how this affects conservation, science, and the very future of life as we know it on this planet. Killer Personalities: 17 Small and oversized prints tell individual stories about the sharks featured in the images. Each image is accompanied by a written explanation behind the photo. Each evening a video presentation is given showing interviews with the divers/photographers who encountered these sharks telling their stories about interacting with these amazing predators who seem to actually have individual personalities. 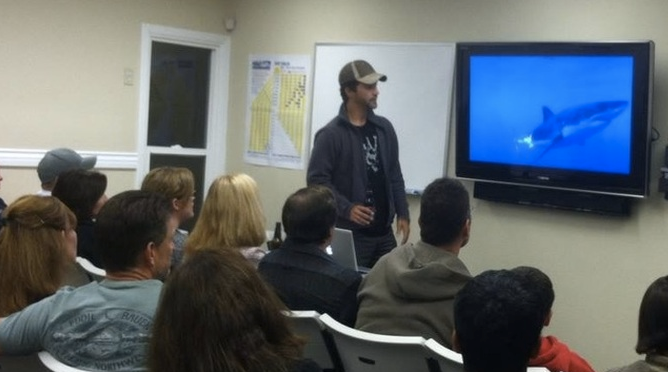 Q&A is held at the end of the video presentation. Photographers featured in the gallery include Amos Nachoum, And Brandy Cassagrande IV, Skyler Thomas, Michael Scholl, and many others. Shark species featured are whites, tigers, and hammers. "We would like to express our gratitude and delight at having Skyler Thomas on stage at our Education Program. We have screened three of his films over the past several years and he has kept our young audience spellbound answering their questions about shark ecosystems and what it’s like to film sharks in their underwater habitat. We recommend him highly, and look forward to having him speak to thousands more middle and high school students at our program in the years to come!" 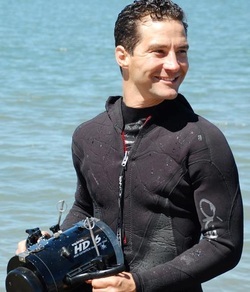 " Skyler Thomas has presented to youth groups (including at risk youth) on several occasions for the The Farallones Marine Sanctuary Association. His dedication to sharks and ocean conservation, his enthusiasm and personal style with students, has made him a great choice when we need a speaker about shark conservation - I would recommend him highly." Skyler works independently and funds his work out of pocket. Although, WSV would love to educate everyone for free, funds are needed to continue the work and hopefully turn the education aspect of the company into a full time gig. For that reason, please carefully consider what your organization is able to contribute.